It must be allowed to grow. It must be invested in. It must be the center of the universe. I believe it’s fairly easy to determine when and where things are out of alignment in a franchise organization – disgruntled franchisees, frequent franchisor employee turnover… just to name a couple that would be very apparent. Obviously, these are the results of, but not the root of the problem that caused things to move out of alignment. Mostly the problems occur (and fester) due to poor communications and lack of transparency between franchisor and franchisees. Inconsistent messaging adds fuel to the fire. Basically, similar problems to a marriage or other types of relationships that fail. As for methodology to realign that takes full commitment from all parties to the relationship. However, in a franchise relationship it takes the franchisor to take the bull by the horns and lead the charge. It takes full commitment to open, honest, transparent communications. Even through difficult scenarios. After all, franchisees have made a significant investment and they do need to understand the good, bad and ugly. The precarious issue is, how much is too much? do franchisees need to know everything? Getting back to square one, a benchmark of sorts is critical as emotions running high will dictate more rather than less. I talk a great deal about positively memorable experiences and I believe it applies to the franchise relationship as well. I won’t get too deep here as I’ve authored an article on the topic in the IFA’s Franchising World magazine. But I will share my thoughts on what I refer to as, “The Emotion Circle”. This circle could be looked at in any transaction or relationship. There are seven key steps within the circle. Think in terms of a clock with the top being the starting point. That’s where the relationship begins. Once something occurs that doesn’t meet expectations the first step is surprise. From there it may escalate to the next steps of disappointment and doubt. Or, it may not escalate but the next “incident” moves the needle along. Sometimes an unaddressed issue moves it. Now, it’s inevitable things happen and expectations aren’t met or even understood. Which is why open, transparent communications are paramount. If the issues are discussed openly and frankly in a respectful way, the needle can be moved back to the 12 o’clock position with no or minimal chance of fueling a fire. However, if not addressed in a timely and respectful manner the fire burns rapidly and on occasion to the point where it’s out of control. And, just like wildfires in the forest, these fires can jump across roads from house to house and community to community with devastating results. 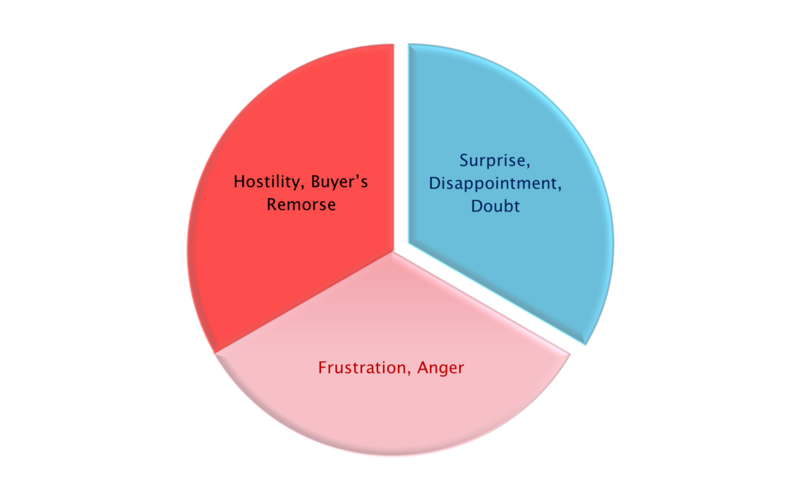 In the case of the Emotion Circle burning out of control, the next steps, often in rapid order include frustration, anger, hostility and remorse (think “buyer’s remorse). The end result is typically broken trust and as we know, trust is the backbone of ANY relationship. So, in order for there to be realignment, trust must be rebuilt. It’s not easy but it can be done, but it takes a huge commitment. Entrepreneur vs. Businessperson: Is there a Difference? George, thanks for commenting on this discussion. Yes, it is all about expectations. The old adage of “under-promise and over-deliver” would be great to follow. In any event, the key is communications and full transparency. Its what builds and maintains trust, and that establishes foundation for the long-term. Again, thanks for your comment. It is very much appreciated. I liked this comment, but Although I agree with everything that was said, I felt compelled to ad this. You see, I think that sometimes expectations can be built so high in order to help make a sale, that they can’t be met, which leads to discontent and conflict. How you begin a relationship is how it will evolve. Rather than giving people hype give them reality; people are savvy and they can deal with reality and if they can’t then you are just encouraging an accident that is waiting to happen.. When you buy a car, you don’t need to know how the engine, transmission, hydraulics electrical system or brakes work, all you need to know is that the cumulative acquired knowledge will get you to your destination comfortably and securely, however if your dealer leads you to believe that it will perform like a jet plane, then chances are you will never get to your destination and most likely you will be dead.. It is better to understate expectations and to have your prospects be pleasantly surprised and if your client cannot deal with realistic expectations, then it is better to find out sooner rather than later; you will both be better off for it.